In her first TV interview since the death of her husband, Apple co-founder Steve Jobs, Laurene Powell Jobs spoke with NBC’s Brian Williams about immigration reform, and her efforts to ensure immigrants can live fully productive lives. >>> wife of the late steve jobs . she goes before cameras rarely. she prefers to operate quietly as a philanthropist but has chosen to do so tonight because of a cause -- immigration, and the dream act . with recent polling showing 64% of americans now favor allowing undocumented immigrants to have the opportunity to become legal citizens, this is the cause that brought her east from california this past week. she is one of the least likely people to take a public stand or join in a demonstration on capitol hill . maureen powell jobs, wife of the late steve jobs is an intensely private person. but with the film maker, davis guggenheim she went to warve wash this week to push for immigration reform , especially on behalf of young undocumented immigrants . he's behind "an inconvenient truth" and waiting for superman." he and powell jobs screened the film for congress. it is called "the dream is now." >> i'm undocumented, unafraid and unashamed. >> there is movement on both sides. there is enough acknowledgment that this is a time when we can get serious legislation passed. so that's why we are willing to raise our voices to pledge so much time and passion and energy towards helping in any way we can to get this done. >> do you care how they come to it? do you care how they get there? do you care if rand paul chooses to say these are potential taxpayers? do you care if some people say, look, if it keeps my kid out of the marine corps , that's fine? do you care how they come to it as long as the vote goes your way? >> i think people are motivated in different ways. i don't mind if someone comes at immigration reform to expand the tax base. because i know individuals who are caught in this purgatory, all i want to do is help find some redress so that they can live fully productive lives. if it means that we have strange bedfellows, so be it. >> one more thing here. powell jobs made it clear for reasons of family and privacy she did not want to discuss her husband's death. she says she never will. she was willing to talk with us about what he left to us all. >> his private legacy with me and the kids is that of husband and father. we miss him every day. having the body of work surrounding us is actually really a beautiful reminder. 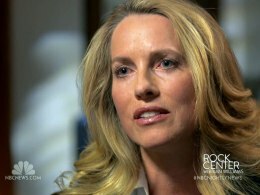 >> we will air our conversation with laurene powell jobs tonight at 10:00 p.m ./9:00 central.